Although I do not generally eat eggs for breakfast myself, there are times when I want to fuss a little more when we have guests and so I’ll bake a breakfast cake, fry up some thick sliced bacon, and perhaps offer a tasty slice of quiche. 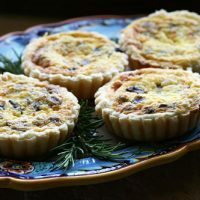 I recently picked up a set of mini tart pans with removable bottoms that inspired me to make these delicious mini quiche. Caramelizing onions gives them a rich, sweet flavor that compliments wonderfully with salty crisp bits of pancetta. Add some flavorful chunks of gorgonzola cheese and you have a mouthful of flavors in a small buttery crust. If you find Gorgonzola cheese and bit too strong, feel free to substitute any melting cheese such as Gruyere or Fontina. I included a range for the cheese, as we love the bite of this Italian blue cheese but others may like to temper the flavor just a bit. 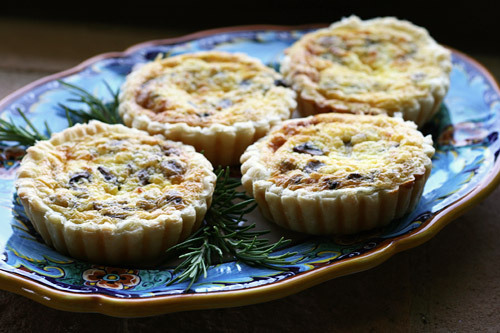 These mini quiche would also be great served at lunch with a crisp mixed salad! 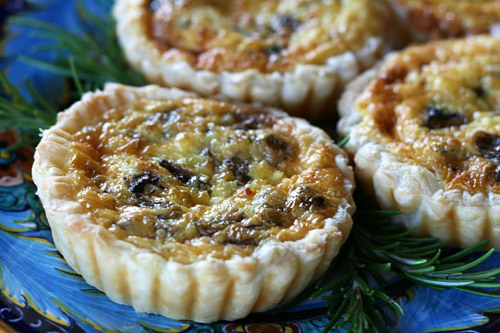 These mini quiche would be great for a holiday brunch buffet. Roll out the pastry thinly on a lightly floured surface and cut out circles to line 8 mini quiche pans (or 1 (9-10 inch) pan). Prick the base of the tart bottoms and refrigerate for 15 minutes. Bake for 5 minutes, then cool on a large baking sheet. Melt the butter in a heavy frying pan and then add the chopped onions. Cook over low heat, stirring often until onions are very soft and lightly browned, about 15 minutes. Divide the onions and sprinkle into the bottom of the 8 quiche pans. Add the pancetta into the pan and cook over medium heat until crisp and browned, about 5 to 7 minutes. Evenly sprinkle the pancetta on top of the onions. Crumble the Gorgonzola cheese and divide this into the 8 pans, and then add the grated Parmesan cheese. Finally, sprinkle the parsley evenly over the onions and cheese. In a bowl, beat together the cream and egg yolks until light. Add the chopped rosemary and cracked pepper. Pour the egg and cream mixture evenly into each mini quiche leaving just a little room to expand. Bake in the preheat oven for about 20 minutes or until lightly browned and set.